Heat the oven to 350°F. Unfold the pastry sheets on a lightly floured surface. Roll each into a 10-inch square. Cut each into 4 (5-inch) squares, making 8 in all. Place 2 tablespoons chocolate chips in the center of each pastry square. Brush the edges of the pastry with the egg. 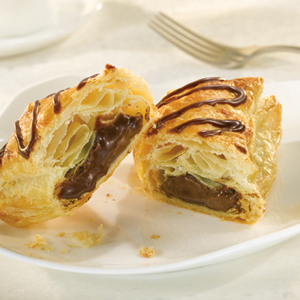 Fold each pastry over the chocolate chips and press to seal. Place the filled pastries onto baking sheets. Brush the pastries with the egg. Bake for 15 minutes or until the pastries are golden brown. Let the pastries cool on the baking sheets for 10 minutes. Remove the pastries from the baking sheets and let cool completely on wire racks. Cook and stir the remaining chocolate chips and the butter in a heavy 1-quart saucepan over low heat until the mixture is melted and smooth. Stir in the confectioners' sugar. Stir in the water, adding additional water, if necessary, until desired consistency. Drizzle the icing over the pastries.